Whether you’re currently looking for a new home or not, you’ve probably heard the phrase, “Get pre-approved.” Perhaps it was through a radio or TV ad, on social media, or from your friends or family. 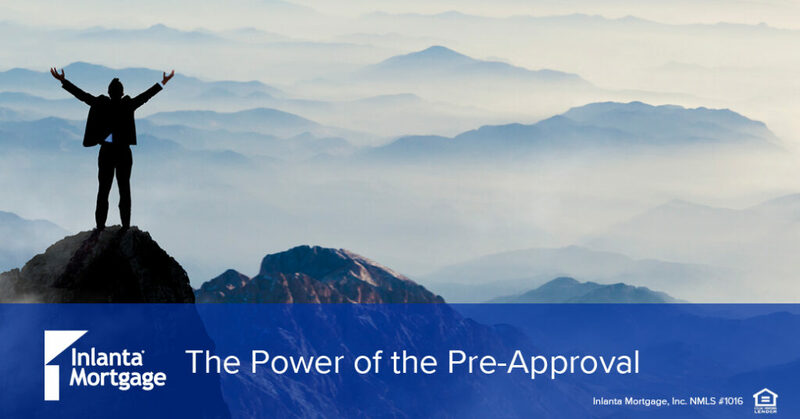 What you should know is what being pre-approved means in the homebuying process, and how it can make you stand out in a crowded buyer’s market. To get a mortgage loan, you need to be pre-approved by a lender. This means that your lender will need to collect certain documentation, such as bank statements and W2s, to verify your income and determine that you are able to repay the loan. With a pre-approval, your Realtor will know you’re a serious buyer and understand your budget, helping narrow your home search to homes that are a right match for you. It can save you from the heartache of falling in love with a home you can’t afford, while letting your realtor know that you’re ready and able to make an offer on a home anytime, anywhere. For the sellers, a pre-approval makes you an attractive buyer as it shows sellers that you are financially capable of purchasing their home, giving them the peach-of-mind that your offer will stand. Lastly, it expedites the closing process which means smoother stress-free closings and getting you into your new home that much sooner. Ultimately, getting pre-approved is a smart move if you’re looking to buy a home anytime soon. To get your free pre-approval, reach out to one of our loan experts in your area or apply for your pre-approval today using our fast and easy online application process! At Inlanta, we believe in honoring our Vets who have proudly served and sacrificed for our country to protect our freedom. And it’s personal for us, with our Vet loan officers representing every branch of the military. If you are a veteran or active military member, it is our privilege to serve you to help make homeownership possible. We are all committed to serving Veterans with our VA loan program, and have also partnered with Pets for Vets, an organization that helps pair rescue dogs with at-risk returning veteran, and donated $25,000 to their cause earlier this year. 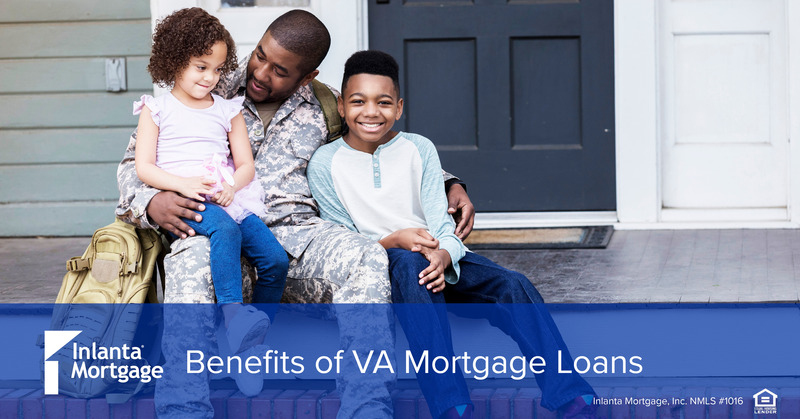 A VA (Veterans Affairs) mortgage loan is designed specifically for service members, veterans, and eligible surviving spouses to help them purchase a home. PMI is usually required if a down payment of 20% is not provided when purchasing a home. With the VA mortgage loan, both the down payment and PMI requirements are waived for veterans. What Can You Do with a VA Loan? Veterans and surviving spouses must meet requirements to qualify for a VA mortgage loan, based on available entitlement and years of service. To learn more about our VA mortgage loans, contact your local Inlanta loan officer today. This year marks the 75th anniversary of the GI Bill! Passed in 1944 as the “Servicemen’s Readjustment Act,” the law that positively impacted millions of veterans and their families by providing a wide range of benefits to Veterans including low-cost home loans, education and vocational training, unemployment payments, and an expansion of Veterans’ health care. It’s officially March Madness – the height of any college basketball fan’s year! 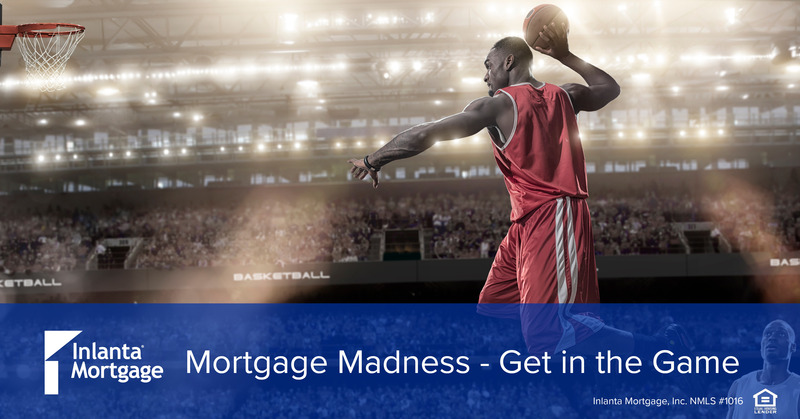 It’s also time for “mortgage madness” as we enter into the height of the homebuying season – the spring market. You may have your team picked, your bracket filled in, and your wings pre-ordered for the big game, but do you also have your game face on for the competitive spring homebuying season? Here’s some pre-game strategies to help you score big on the home of your dreams. Did you know that you + your mortgage pro + your real estate pro = the dream team? That’s right! Don’t go through this process alone when you can have a dynamic duo of industry professionals coaching you through it all. Buying a home is not a game-time decision and having that coach by your side will ensure that you’re taking all the right shots to score the home of your dreams. To find a mortgage expert in your area today, click here. Before you even lace up your high-tops and hit the court, make sure to take advantage of Inlanta’s easy online application process and get your pre-approval before you even begin home shopping. This is crucial because it allows you to know exactly what you can afford, and also give you an edge over your homebuying competitors who don’t have the security of a fully underwritten pre-approval. You may have heard that today’s mortgage rates are still at historic lows. In fact, MarketWatch recently reported that rates have now fallen to a one-year low, making now the perfect time to lock in your mortgage interest rate before the clock runs out with Inlanta’s Lock & Shop program. For more info, check out our Benefits of Rate Locking before Home Shopping blog. If you’re ready to take the winning shot and become a homeowner today, we’d love to chat with you! We have a deep bench of loan programs, as well as down payment assistant programs to help you score the home of your dreams. Inlanta Mortgage has been helping homeowners win the home of their dreams throughout the nation for more than 25 years, and we put our customers first in every transaction. See why our customers say trusting us with their mortgage transaction is a “slam dunk” here! Whether you’re getting in the game or sitting on the sidelines this year, we hope you enjoy a successful spring! Recent news of a positive spring market for home buyers probably has you wondering – what is my home worth and is it time put it on the market? Today when we have questions, we turn first to Google. 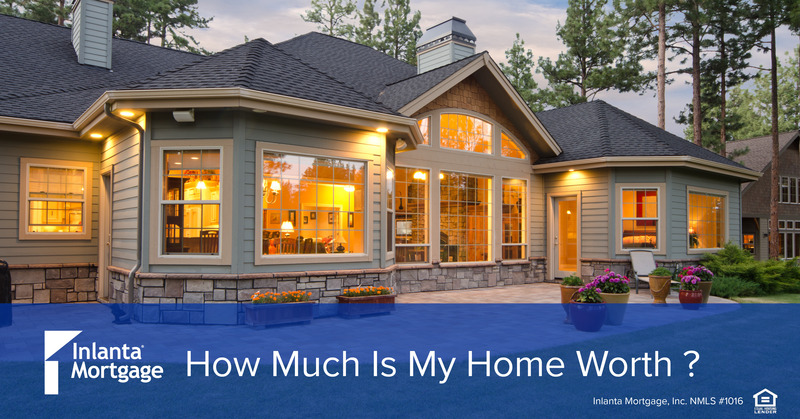 A Google search of “what is my home worth?” pulls up a multitude of online home evaluation tools that combine things like public records, property transfers, tax assessments, local listing prices, etc. to offer an estimated price for your home. You can find these tools on popular real estate hubs like Zillow or Redfin, however, the predicted price is just that – a prediction – so make sure to check into steps 2 & 3 below before taking the answer as final. Working with a licensed real estate professional is important when determining your home’s worth. They will have the inside scoop on past home sale prices and comparable listings in your nearby neighborhoods. They’ll also be the ones who will put in the time, effort and research necessary to find out exactly how much your home will go for. They also know what’s selling currently, and can help you identify simple things to make your house more appealing. Don’t count your mortgage pro out of the process just yet! They can provide you with the latest scoop on current market trends and mortgage rates, and can also connect you with trusted real estate professionals as well as skilled appraisers. Why Is Knowing My Home Value Important? Knowing exactly what your home’s worth can benefit you even if you’re not planning to sell your home anytime soon. You may find that your home value has increased giving you the chance to refinance your mortgage and utilize the cash to upgrade your home, help pay off debts or meet other financial goals. Contact your local Inlanta Mortgage loan officer today to find out how best to determine the value of your home, then get prequalified for your next home, or learn about your refinancing options! Dealing with debt can be overwhelming and straining on your finances. 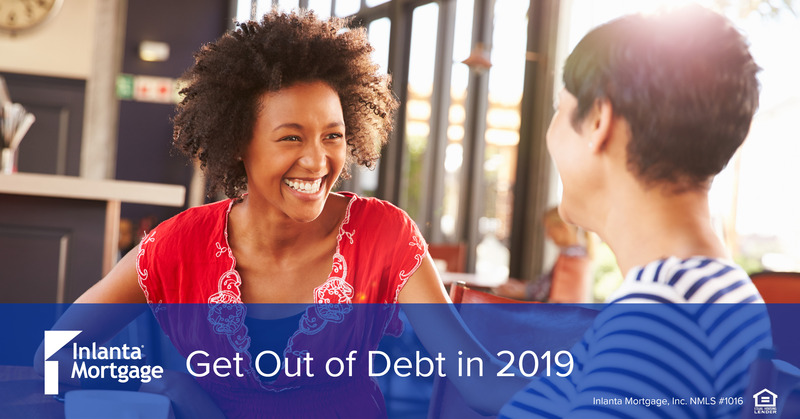 If it is your goal to be debt free in 2019, take a look at our top tips. Set a Firm Budget – First and foremost, evaluate your income, debt and expenses, then set a firm budget using those numbers. This is a great way to figure out exactly how you’re currently spending your money, and where you are being frivolous, to help know where to make adjustments. If your income doesn’t cover your expenses, it may be time to consider asking for a raise at work, taking on a second job, or adjusting your lifestyle to live below your means and focus on paying off debt. Step 1: List your debts from smallest to largest. Step 2: Make minimum payments on all your debts except the smallest. Step 3: Pay as much as possible on your smallest debt. Step 4: Repeat until each debt is paid in full. Streamline & Simplify – Create an “automated budget” by setting up auto-payments for each paycheck to cover your bills and add to your savings account. This helps avoid spending income on non-essentials because you’ve spent the money before it even gets into your “spending” account. You can also simplify your lifestyle by cutting out unnecessary spending and putting daily practices into place, like making your coffee at home or packing your lunch for work. While this step can be one the hardest of all – we all love our Starbucks — remember that this is only temporary but is necessary to help give you financial freedom to do even more in the future. Consider a Refi – if you’re a homeowner, there’s a chance you’re paying a higher interest rate than today’s rates. By refinancing to lower your interest rate, you can save money on your monthly mortgage payments that frees up cash to help pay down debt. Or, depending on how much equity you have, you could even do a cash-out refinance to pay off credit card debt, car loans, personal loans, school loans, etc. To learn how the right mortgage can help you reduce debt, click here to contact your local Inlanta officer today!